I first came to know Cherie Dimaline's writing last year, when I read "Legends are Made, Not Born" in Love Beyond Body, Space, and Time: An LGBT and Two-Spirit Sci Fi Anthology. The character she writes about in that story is named Auntie Dave. I wrote, then, that I had to "just be" with Auntie Dave and that story for awhile. There's a quality in Dimaline's writing that reached from the page, into my being. That's the case, too, with The Marrow Thieves. I paused again and again as I met and came to know 16 year-old French, and then the people who would become his family: Miig, Wab, Zheegwon, Tree, RiRi, Minerva, Chi-Boy, and Slopper. Later, French will meet and fall in love with Rose. On page 32, there's a line about her that squeezes my heart. "We had a future and a past all bundled up in her round dark cheeks and loose curls." Humanity has nearly destroyed its world through global warming, but now an even greater evil lurks. The Indigenous people of North America are being hunted and harvested for their bone marrow, which carries the key to recovering something the rest of the population has lost: the ability to dream. In this dark world, Frenchie and his companions struggle to survive as they make their way up north to the old lands. For now, survival means staying hidden.... but what they don't know is that one of them holds the secret to defeating the marrow thieves. The hunters in Dimaline's story are "the Recruiters." They're the ones French and all the others are hiding from, running from. The Marrow Thieves begins when French is 11, being chased by those Recruiters who want to take Indigenous people to schools to take their marrow. That's a specific reference to the residential schools of the past, where so much was taken from Native children. 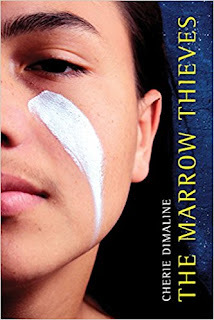 It is one of many points in The Marrow Thieves where--painfully or with exquisite beauty--Dimaline's story resonates with me. It will resonate with other Native readers, too, especially those who are Anishinabe. Several tribal nations are mentioned in here, too. One moment that made my heart swell is when the group has come to an abandoned hotel. After months of sleeping on the ground in tents, they cautiously enter the hotel, and then later, enthusiastically say good night, each in their own rooms, on beds. For the first time, French and Rose are curled up together. They're startled when they hear little Ri say "French, can I sleep with you guys?" and then a minute or two later, Slopper (he and Ri are the two children in the group) appears and says "Move over, French. I can't sleep." They drift off to sleep. That's how it is. There's a passage in The Marrow Thieves that, for me, embodies what matters for any society. French thinks about how, when a people don't have their youngest and their oldest, they are without deep roots, and without an acute need to protect and make things better. That's a key piece of why this story is one I'm carrying. It is about caring, about love, about how people can continue, and will continue. There's so much more to say. About... song. About Miggs and Isaac, about Ri, about Minerva, about French. But I'll stop and let you be with these achingly dear characters. I highly recommend The Marrow Thieves. I ordered my copy from Canada. Published by Dancing Cat Books (an imprint of Cormorant Books), it isn't available in the US till later this year. Back in the early 1990s when I started graduate school, I learned of the work of a Santee, Cree, Abenaki woman named Doris Seale. I read her writings about the ways that Native people are depicted in children's books. Those words were fierce. I learned a lot from her. She also wrote two books of poetry: Blood Salt, and Ghost Dance. In 2001, she won the American Library Association's Equality Award for the work she'd been doing, for over 40 years. That year, ALA's meeting was held at a Marriott Hotel in San Francisco that was in a labor dispute with its workers. 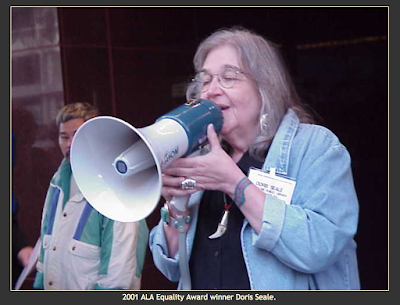 Rather than cross a picket line to accept her award, Doris Seale joined that picket line. Doris started her work as a librarian a year before I was born, in the children's department of the Brookline Public Library, in Brookline Massachusetts. She passed away this year. That marks 60 years, or so, of her words, doing work, for children. In her honor, I'm going to start compiling a bibliography of her writings. It will be on this page. At this point in time, people in the fields of education and library science point to me as an important voice in understanding the ways that Native peoples are depicted in children's books. I learned a lot of what I know from Doris Seale. I invite you to read her work. Cite it, and share it. And let me know of ones I've missed, too. Seale, D. (1981). Bibliographies about Native Americans—A mixed blessing. Interracial Books for Children Bulletin, 12, 11-15. Seale, D. (1984). Indians without Hope, Indians without Options--The Problematic Theme of Hatter Fox. Interracial Books for Children Bulletin, 15(3), 7. Slapin, B., & Seale, D. (1988). Books without bias: Through Indian eyes. Oyate. Seale, D. (1991) 1492-1992 from an American Indian Perspective. In Lindgren, M. V. The Multicolored Mirror: Cultural Substance in Literature for Children and Young Adults. Highsmith Press, W5527 Highway 106, PO Box 800, Fort Atkinson, WI 53538-0800..
Seale, D. (1992). Let us put our minds together and see what life we will make for our children. Slapin and Seale, Through Indian Eyes: The Native Experience in Books for Children, 7-12. Slapin, B., & Seale, D. (1992). Through Indian Eyes: The Native Experience in Books for Children. New Society Publishers, 4527 Springfield Ave., Philadelphia, PA 19143. Slapin, B., Seale, D., & Gonzales, R. (1996). How to tell the difference: A guide to evaluating children's books for anti-Indian bias. Berkeley, Calif.: Oyate. Seale, D. (2001). Parting Words: The Works of Paul Goble. Multicultural Review, 10(1), 120-120. Slapin, B., & Seale, D. (2001). Presenting the Wounded Knee Massacre in Books for Children: A Review Essay on Neil Waldman's Wounded Knee. MultiCultural Review, 10(4), 54-56. Seale, D., & Slapin, B. (2006). A broken flute: The Native experience in books for children. Rowman Altamira. Seale, D. (2007). Navajo: Visions and Voices Across the Mesa. 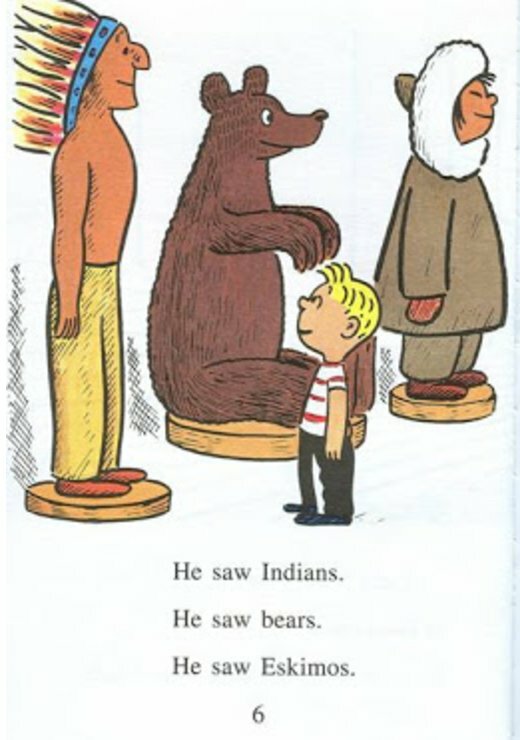 Review at American Indians in Children's Literature. Last month, Harper Collins celebrated the 60th anniversary of its I Can Read books. 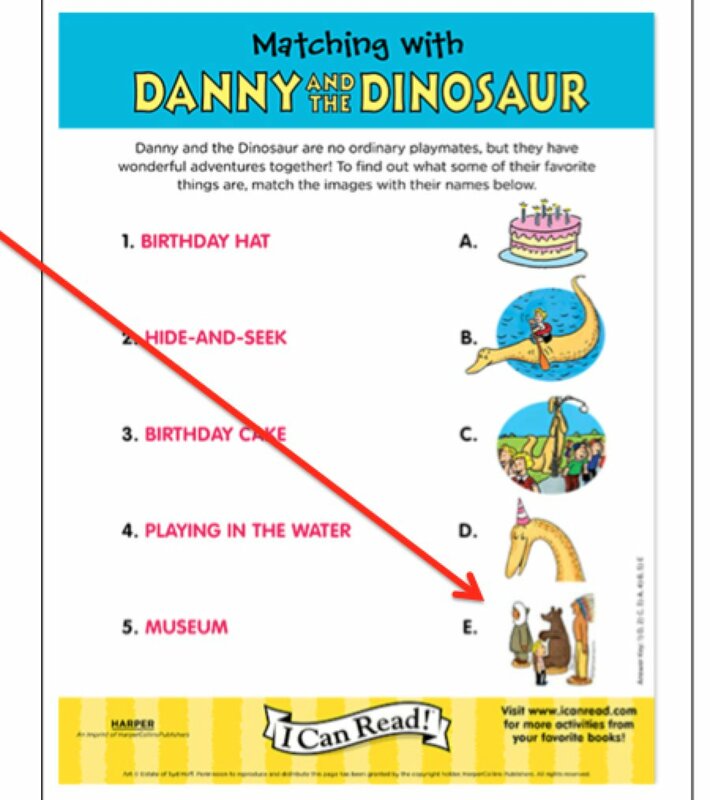 I wondered if they would remove this page from the new edition of Danny and the Dinosaur, by Syd Hoff. The book was first published in 1958. I went to the Harper Collins website and saw that they've got worksheets up for some of the I Can Read books. They had some for Danny and the Dinosaur, including this one, which told me that they clearly had not revisited that page. I did a screen capture of it, added the red arrow, and tweeted to Harper Collins, asking them about that page. "We appreciate your valuable feedback and sincerely apologize that this activity was offensive. It has been removed from the site." It is, indeed, gone, and when I pressed them about the page in the actual book, I got a DM (direct message) that said "We are reviewing the book and will be in touch in the future." I thanked them. When they get in touch, I'll be back with an update. Let's hope they're getting rid of that page. Chelsea Clinton's picture book, She Persisted, was released on May 30, 2017. Parents and teachers will buy it. So will activists. Published by Philomel Books (an imprint of Penguin), it is already marked as a best seller at Amazon. The title, as many AICL readers will likely know, is based on Mitch McConnell's remark about Elizabeth Warren, who persisted in trying to read Coretta Scott King's words on the Senate floor in February of 2017. Some of you may recall that I've written about Warren before, when she persisted in making a claim to Cherokee identity. That persistence showed a lot of willful ignorance. I don't want to get sidetracked, though, in this post that focuses on one page in Clinton's She Persisted. I like the concept: a picture book about women who push back on those who want them to be quiet, to sit down, to go away... that's a great idea. But the execution--with respect to the page about Maria Tallchief--fails to push back on the ways that most people think about Native peoples. 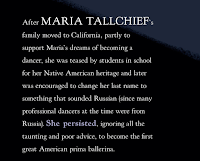 "After MARIA TALLCHIEF's family moved to California, partly to support Maria's dreams of becoming a dancer, she was teased by students in school for her Native American heritage and later was encouraged to change her last name to something that sounded Russian (since many professional dancers at the time were from Russia). She persisted, ignoring all the taunting and poor advice, to become to first great American prima ballerina." Some of the students made fun of my last name, pretending they didn’t understand if it was Tall or Chief. A few made war whoops whenever they saw me, and asked why I didn’t wear feathers or if my father took scalps. When you hear "Native American" or "American Indian," what image comes to mind? For a lot of people, it will be a large feathered headdress, some war whoops, a tomahawk, a tipi, and maybe a herd of buffalo. In other words, the same things that Tallchief had to deal with in 1933. It is way cool that Clinton is showing us a Native person as a ballerina. That image counters the other imagery that comes to mind, but calling her a Native American leaves the generic or monolithic "Native American" term itself, intact. 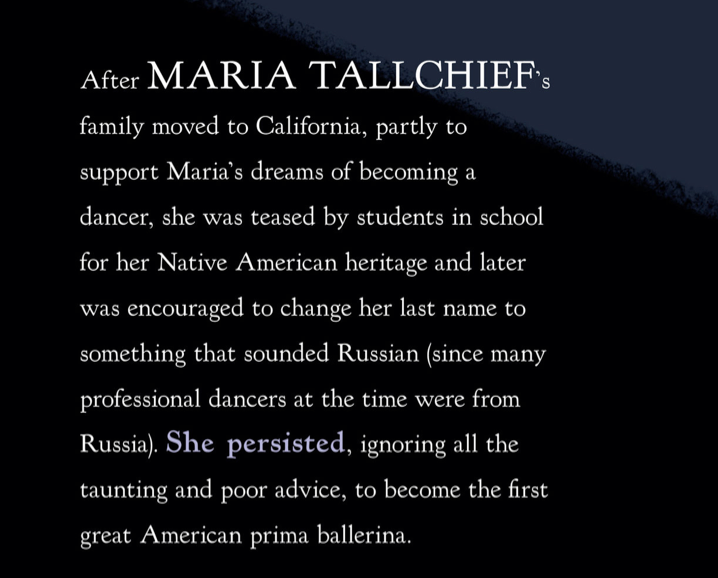 In other words--I wish Clinton had written in there, somewhere in those 60 words, that Maria Tallchief was Osage. It is a missed opportunity for Osage kids to see the name of their nation, in print, in a picture book that millions of children are going to read. That bit about her name is interesting, all on its own. Clinton tells us the ballet company wanted Tallchief to change her last name to something so that it sounded Russian. In her autobiography, Tallchief wrote that they wanted her to add an 'a' to Tallchief and swap that 'f' for a 'v' so it would be "Tallchieva." Sheesh! She didn't want to do that, but did agree to use "Maria" rather than her given name, Betty Marie. If I was teaching She Persisted, I'd substitute "Osage" for "Native American." And of course, I'd talk about the Osage Nation. I've not studied how Clinton writes about the other women in the book. If you have, let me know in the comments. Tallchief, Maria. Maria Tallchief: America's Prima Ballerina. Henry Holt and Co.